Good morning! Thanks for stopping my blog as part of the hampton art & echo park blog hop! 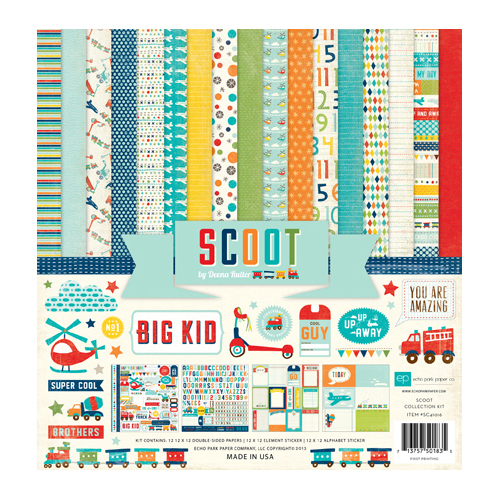 I have a quick little project to share with you today featuring the “Scoot” stamp set and paper collection. I love these colorful little lunch sacks…I like having a bunch of them in my stash – they are Hallmark brand and they are really inexpensive. They make great bases for decorating a quick gift bag! To begin, I folded over the top of the blue bag and cut two blocks of patterned paper to create the oversized flag banner on the front. I used the “cool guy” tag stamp to create four tags in different colors. I arranged them “banner style” along the top of the folded bag. I added colorful little gems to each tag. I stamped the “happy birthday” sentiment on a bit of patterned paper that had several colorful “x'”s…the effect is subtle, but I like having all of the colors in the title block. I used foam dots to attach the sentiment to the top of the bag. Finally, I punched holes in each side of the bag and tied the top closed with coordinating baker’s twine. This is only one set of stamps, but there are several more collections available so be sure to follow the entire blog hop so you can see all of the fun echo park/hampton art collaborative sets! After you’re done hopping, be sure to enter for a chance to win a fun prize from hampton art or echo park! Here are the Giveaway details: For a chance to win either a stamp prize from Hampton Art or one of three collection kits from Echo Park Paper, please continue on the blog hop leaving a comment on each blog. Winners will be selected and announced both on the Echo Park Paper and Hampton Art blogs on Monday, April 29th. All comments are due by Sunday, April 28th at midnight EDT to qualify. Love this stamp set & paper ~ the brights colors are great! Great projects too! Love your tag banner, how clever! Cute project! Love the way you used the stamps Wendy! The GUY banner is AWESOME! Love the banner for the background on the bag too. GREAT job! Super cute Bag and topper. love the colors thanks for sharing. Loving your banner!! This is fabulous!! I know I am going to be getting this paper for my little guy! I think the Scoot line is so adorable, unfortunately I don't have any little boys but I can still appreciate it. Great idea for a gift bag. What a fun project!!! Love it! Love how you stamped those tags on the various colors! Gorgeous! The tag banner is great! I'm making a quilt right now using Scoot fabric. LOVE it in paper too! Love your gift bag! Thanks for sharing. This paper line is just fabulous for boys! Love the gift bag!! The tags are awesome! What a great way to dress up that bag! Love the banner of tickets! such a great & cute idea! What a great way to celebrate a bday! Love the banner. cute idea! Could be used for lunch or even a gift! Just too cute! Thanks for the great idea. That is one cute gift bag! Great idea especially for parties. Thanks for sharing. Cool gift bag for a guy! What a cute idea for a gift bag! Great use of that banner tag stamp! I didn't know you could get colored bags like that. The papers you added and the cute stamp to make the banner are sweet. Thanks for sharing. I love these lunch bags too !!!!! Very cute idea ! Love your project! What a great idea! Cute gift bag, thanks for the inspiration! Love the paper that matches the helicopter in the stamp set. It's all so pretty and desirable. The tags look great with the bag color and the paper! Any little boy would love that bag. How cute. Love the colorful bag. It would be so cool to make a little guy's lunch bag like this on his birthday. Or even on a just because day. Great job. Oh... This is really fun. I love that banner. Great idea. fun and your design is great. Super fun and cute gift bag!!! Way to make it special! TFS! Fabulous project! So glad these two fantastic companies are teaming up! OMG...this is SO cute! Love that banner in all the different colors! I love EP products! Hopping along with you on Earth Day! wow! Love the idea of the tags in different colors strung along the top! So cool! love the colors in Scoot! what a creative way to use the tag stamp - love the banner. Oh do I love this gift bag! Love how you stamped the banner pieces on patterned paper! Scoot! Love the boy theme! My photos of my now grown son would be great on this! Simple, but such an impact! Love the color coordination of the banner and header with the paper. Very cute idea - great for party favors too! Love how you created the tags. So cute! What a great way to make a lunch more special!! Super, super cute! I love the paper and stamps! FUN! What a great idea! Love the bag! TFS! This project is such a perfect example of the matching stamps and paper sets. Love it - it is so very cool, any guy would be lucky to receive it. I love anything made by Wendy Sue and how clearly she explains how she makes it! Thanks for the chance to win - Have a great day!! Love. love. Love this project! adorable gift bag! loving the hop. I like your card - so funny! Great gift bag! Perfect for party favors for a boy birthday! Thanks for the inspiration! I like your gift bag Wendy! And I adore Scoot collection! What a great guy gift bag! You did a fabulous job with this hop! I'm hopping along! 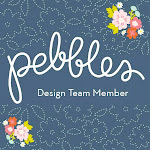 Glad I hopped in--your project is so cute! I think this is a wonderful idea that I really need to remember to try. What little boy wouldn't just love this? The Scoot papers and those stamps are adorable used like this. Your gift bag is very cute, I love the more masculine design! Cute! Love the stamped tags!